The dish can be prepared to Step 3 up to two days in advance, then covered and refrigerated. Allow the unbaked mixture to come to room temperature on the bench for 45 minutes before continuing from Step 5. Spread the butter evenly across the base and sides of a 3-litre baking dish. Cut bread into 1.5cm slices. Peel, de-seed and thinly slice the papaya. Toss pecans with 1 tbsp of the brown sugar. In a large bowl, whisk together the eggs, milk, sour cream, vanilla, cinnamon, salt and remaining sugar. Stand a row of bread slices along one end of the buttered baking dish. 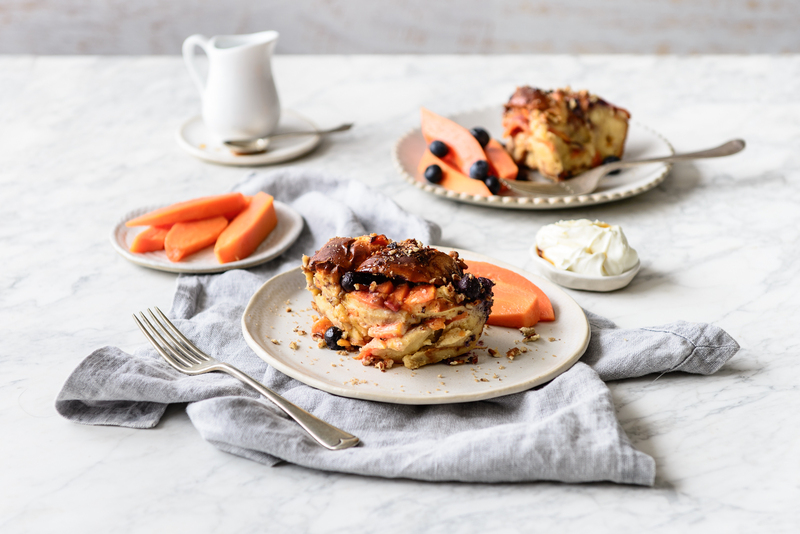 Arrange papaya and remaining bread in overlapping layers, then top with blueberries. Pour egg mixture evenly over the bread and fruit and press gently with the back of a large spoon to submerge. Let the baking dish stand at room temperature for 30 minutes while the bread absorbs the egg mixture. Preheat oven to 180°C. Top the bread and fruit with the sugared pecans and bake for 35 – 40 minutes, until golden and puffed in the centre. If the top is browning too quickly, tent with foil for the last half of baking. Let stand 10 minutes before serving.